The parents of the great cartographer Ken Buttercase were employed by a small railway in a remote country. 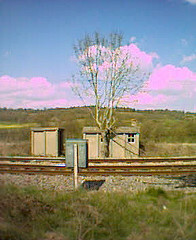 They lived in a wooden hut which served as a signal-box. A threadbare curtain of rep divided the hut into two halves. In one half, the Buttercases ate and slept and baked and washed; the other half contained the signalling controls and was also used to store an ever-changing collection of broken locomotive machinery. Once a day, at noon or thereabouts, a cart would trundle to the door of the hut; two railway workers would deliver some broken bits and pieces and take others away. Mr or Mrs Buttercase would sign one chit for the deliveries, another chit for the pieces removed, and help the two officials – one of whom was tubercular – to load and offload the invariably rusty pieces of metal. Their duties left them little time to devote to their only child. Let us examine these duties in some detail. The railway itself was not busy – the one train passed the hut four times a day; heading north at 4 a.m. and 4 p.m., and heading south at 10 a.m. and 10.15 p.m. Before its passing, the signals had to be set; the cranks, winches, levers, pulleys, knobs, fulcra, and transistor motors all had to be adjusted with frightening precision. In order for this to be done, the broken locomotive-parts had to be shoved out of the way, into the other half of the hut. They could not be kept outside, exposed to the elements, as the company regulations forbade such a practice. Nor could they be stored permanently on the other side of the rep curtain, as not only was this – as we have seen – the family’s living quarters, it also served as the work-room devoted to carrying out the many other tasks they had to perform, which we shall examine in due course. Once all the broken stuff had been moved out of the way, the signalling equipment could be set. Readjustment, back to the original coordinates, took place once the train had passed, after which the day’s conglomeration of broken bits and pieces could be shifted back to the other half of the hut. This entry was posted in Hooting Yard on August 13, 2014 by sal.